And marvelous he is …married to a marvelous woman!!! Sounds like a wonderful tribute to a very special man. I know one of the secrets to longevity is exercise, but it seems equally important to remain engaged seeking and connecting. That is a beautiful tribute, Faye. Thanks, Bruce. Marv will appreciate your wishes. I like this terrific “milestone testimonial,” written as simple declaration, filled with facts but seasoned with humor—and clear affection. Your comment bought a smile to my face, Rosemary. Thank you! Happy birthday, Marv! He’s a wonderful example of how to live! Thanks Heather. Yes, he is a wonderful example which is what prompted me to share. What a wonderful tribute to your beau of many years. As my dear friend I can testify that he is a heck of a guy. I was glad to be part of the birthday celebration. Hy, Thanks for your sweet comment! 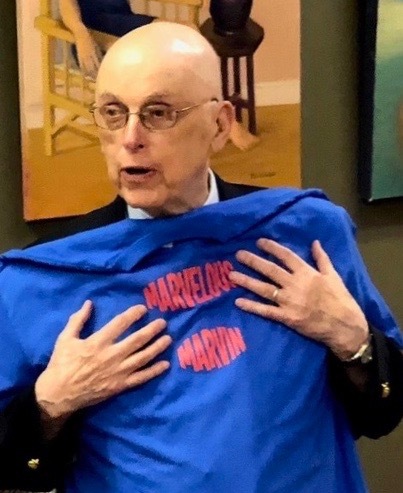 What a terrific tribute to Marvelous Marvin. . He’s quite a guy. I expect he’ll continue to celebrate and share his marvels with his wonderful family and his friends. We’ll be cheering him on for many more years . Great picture . Many thanks, Sheila. I love how you and Hy have been on our cheering squad for years. Terrific post, Faye! A lovely tribute to Marv. Loved reading this. Will show to Becky. It’s been awhile since we’ve crossed paths, but a fond memory when Becky and I joined you and Marv one evening. Also, I read one of Marv’s books and thoroughly enjoyed the book. He and you were a ubiquitous presence at Solstice in the two years I passed through. Say hello to Marv for me. Jim, wonderful to hear from you. I showed your comment to Marv. Like me, he has fond memories of our evening together and sends regards. Warm wishes to you & Becky.